The history of one of the foundational elements of entertainment media today—forensic evidence—and how it is that we make sense of it. Former police officer and crime novelist McCrery (Tooth and Claw, 2009, etc.) worked for many years as a researcher and screenwriter for the BBC. In this history of forensic science, he dons all three hats at once. In the author’s note, McCrery explains that it was during his time as an officer that his interest in the field was established. “I was greatly impressed,” he writes, “that they could glean so much information from such a small amount of evidence.” What follows is a treatise on what the author considers to be the most important steps in forensic science. For example, “it is impossible to overstate the importance of DNA technology in the field of criminal investigation.” Rather than organize the book chronologically, McCrery structures it by sections focused on different aspects of forensic work: Identity, Ballistics, Blood, Trace Evidence, The Body, Poisons and DNA. In each section, the author presents meticulous research into the history of the subject. The “Blood” chapter teems with information about antigens, typing old blood and the many tests used throughout the centuries to determine if a stain was blood and then whether it was human or animal. 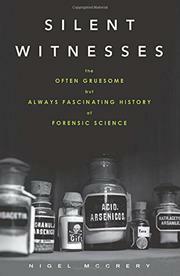 The author also offers colorful anecdotes of investigations gone awry due to a lack of the correct scientific knowledge and murders that were eventually solved after forensic science methods developed enough. However, while the wealth of information is both interesting and important, it is often dry as well. Where McCrery really shines is in his storytelling, which is no surprise given his background as a successful crime novelist. While certain technical portions may be difficult for some readers, true-crime enthusiasts will find the payoff worth the effort.